About a month ago, my neighbors a few blocks away set up a chicken den in their front yard in the middle of the city. My first thought was “how did they get the neighbors to agree to that? It’s so impractical.” The impractical has now turned into one of my favorite ordinary daily acts that I share with Molly and Lily at dawn and dusk. The neighbors have now brilliantly put out a bucket of chicken feed so passersby can feed the chickens and be a part of their “silly” dream. Each time we pass and throw some chicken feed, they all come running to get their share. And every single time, Molly and Lily watch in wonderment. Find your “feeding chickens” act and enjoy the simplicity of the ordinary gifts just around the corner. “Silly” dreams fulfilled make a life well lived. 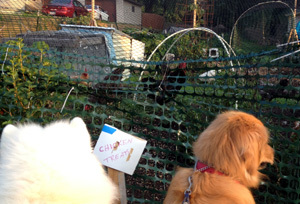 Love the photo – my dogs would most likely be barking at the chickens. Thanks – the girls watch in amazement. I’m surprised they don’t bark.